I think it was during the second or third time I went airborne in a Lancia 037 Stradale—a leap that was higher, faster and further than I’d ever experienced in the previous installment—that I realized how truly jump-happy Forza Horizon 4 is. I didn’t think this was possible, as the last game was also extremely gravity-optional, but here we are. In the three days that I spent with the game, I had an absolute blast. The scope of what’s physically possible to do in a car has been increased to nearly cartoonish levels—and the mods you can perform have expanded to match. There’s actually a method to playing this game and I think I’ve discovered it. The short answer? Build a rally car out of everything you can get your hands on. Forza Horizon 4 is the latest installment of the Forza Horizon franchise. While Forza Motorsport is a more of a racing simulator, Horizon is an action-packed, open-world driving simulator full of cars and equipment to buy, challenges, races and generally living in a freedom-filled world where your craziest car dreams can come true. Set in the UK, the environment undergoes seasonal changes: Autumn, Winter, Spring and Summer. Each season dynamically alters the landscape, so it feels like a shakeup to familiar roads before they get too stale. When it’s rainy in the spring, you can feel the mud squealing beneath your tires. When it’s wintertime, you can feel the crunch of the snow and how it actually gets deep in places. You can hear the crackle of gravel when you traverse off-road. And the scenery that accompanies each season is breathtaking. Because of course it is. It’s a Forza game. Horizon 3 didn’t have snow and ice unless you got the winter expansion pack. Winter is built into this game, which initially turned me off (how are you supposed to drive in snow with summer tires? ), until I discovered you could buy snow tires. That was a game-changer for me. I think I’ve spent most of my game time hooning in the sub-zero conditions. These seasonal changes will be part of the “shared world” aspect of Horizon 4, meaning that seasons, time of day and the weather are all fully synchronized across all players. Season changes will happen every Thursday at 10:30 a.m. EST. Competition seems to be the main focus of Horizon 4. Unlike the last game, which followed a campaign of building up enough reputation to open new festival sites, the new game is much more eager to get you racing, which is what I prefer to do. There are far more racing activities offered here, which is a welcome change. There are a few campaign activities you need to do in order to get everything started, but after that, the game largely leaves you alone. Horizon 4 also adds little things to make sure you’re spending as much (or little) of your time racing as you want. Money is easily made or won, so there’s rarely any need to grind for necessary materials. And you don’t need to fast-travel to the festival site to switch cars anymore, you can have them delivered directly to you anywhere on the map. That part is a huge time-saver. The races themselves seem to be split pretty evenly between road and off-road competitions. But, as a bit of professional advice, I’d say to build yourself a nice rally car to tackle them all with. That’s the best kind of one-size-fit-all vehicle that thrives in the Horizon world. You still need to commute everywhere in the game (don’t worry about traffic, though; the distances are short and you don’t have to obey any laws), so the best and fastest way is definitely crashing through the countryside. That’s a game in itself: Picking out your destination on the map and then seeing if you can get there by just driving straight through whatever might be in your way. Beware, though: Big trees and houses are extremely Solid. Everything else you could hypothetically flatten. The fun is finding out what. This is where a nice rally car comes in handy. From the mods list, you can now add rally suspension and rally/snow tires, depending on the season. I remember being endlessly frustrated in the last game because my Ferrari would keep spinning out whenever I tried to drive it through a pond. It would happen more often than you thought. Now, I would just give it an all-wheel drive conversion, a new suspension setup and rally tires and tank around the map, happy as a clam. The result is a fantastic gameplay experience that’s far more arcade-y than before. 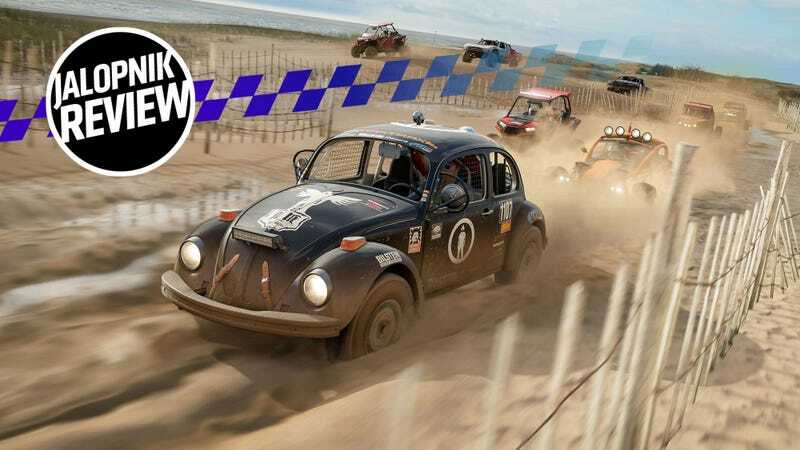 Currently, I’m working my way through the dirt racing championship, which takes me through the muddy countryside, up and down river beds, dodging through tress in dense forests, across mountain faces and straight through the center of towns. You crash through peoples’ backyards and their nice patio furniture, while sheep flee from before you. No, you can’t hit them and they are apparently immortal. The jumps are aplenty and they are hands down my favorite part of the game. And they’ve only multiplied in number since Horizon 3. The game has fully embraced the fact that there’s a whole vertical world to explore and uses every opportunity it has to fling your car up into the air before gravity finally remembers its job and sends you slamming back to earth. It’s a surreal feeling to go off a massive jump and then flick the camera backwards to see the rest of the cars racing all follow in a rainbow arc of flying metal and rubber. You also don’t need to be as razor-precise with your driving style because the game isn’t set up that way. Just point your car in the right direction, brake every so often and have a ball with it. The tactile feel of what’s under your tires and how power gets delivered has been markedly improved, but the learning curve isn’t as aggressive as in the Forza Motorsport games. It is very clear that this game has been engineered for fun. I’ve been driving around with my damage setting set to cosmetic only, another thing I highly recommend. It puts me in a mindset where I don’t actually care what happens to the car (because nothing will), so I’m more open to exploring and doing stunts, which the game rewards beautifully with skill points that lead to further prizes. The barn find activities also make another appearance in Horizon 4 for those who like a good treasure hunt. A few days with the game isn’t enough time to truly explore everything there is to do or see where it goes stale, but I anticipate that it might get repetitive quickly. There are a plethora of races to choose from, yes, but they’re all the same idea. Street racing, dirt racing or rally racing—those are some of the big ones. But that’s why there are seasons and over 450 cars to choose from. But because those rally and off-road mods are now available, I no longer feel confined to just buying all-wheel drive or devoted off-road vehicles anymore. I am free to make any car a rally car. At the time of this writing, I have a rally R34 Nissan Skyline, a rally BMW 2002 and a rally Porsche Cayman GT4 in my garage. All three of them off-road better than they have any right to. And I think that’s truly the magic of Horizon 4. Leaping cars off of mountain peaks is one thing, but turning something that has no business as a rally car into a rally car is a new kind of fantasy. And the best kind of fantasies are the ones that are theoretically attainable. The Standard Edition of the game will cost $59.99, the Deluxe Edition, $79.99 and the Ultimate Edition, $99.99. Forza Horizon 4 launches on Xbox One, Xbox Game Pass and PC on Oct. 2.